The Choir was formed in 1941, with only 8 choristers, at the de Havilland Aircraft Factory in Stag Lane, Edgware. Originally known as 'The de Havilland Male Voice Choir’, the choir practiced two nights a week in the works’ canteen (air-raids permitting) under the baton of Ivor Jones. The choir quickly developed a wide musical repertoire, and performed concerts, often for charities and good causes, across London and the Home Counties. Sometime between 1946 and 1948, a disagreement with de Havilland led to the choir leaving the factory. The Choir took the opportunity to change its name to the Beverly Singers, when rehearsals moved to Beverly Drive. However, this caused some confusion with a similarly named popular group of female singers, at the time. So, making reference to the Greek god of music and song, it became the Apollo Male Voice Choir. Relatively recently, the choir added "Harrow" to its name and removed "Voice", to form its current title, identifying more strongly with the London Borough in which it is based, and with Harrow’s Mayor as its Patron. 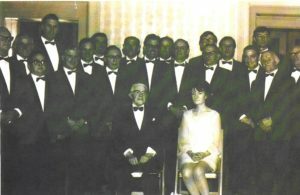 This is a photograph of the choir around 1968, when they were known as the Apollo Singers. The choir has changed its rehearsal venue a number of times over the past 70 years – pubs, an Ex Servicemen’s Club and Community Centres. In 1993, the Choir moved to its current rehearsal venue at the Harrow Arts Centre (although even then there was a blip of three years between 2006 and 2009 when the Arts Centre closed). Throughout its history, the Choir has sung at venues as diverse as the Royal Albert Hall, Cologne Cathedral, Arsenal Football Ground and Wormwood Scrubs Prison. The Choir has also performed in Germany, Ireland, USA (1998), Belgium (2002), Normandy (2005), Scotland (2008), Staffordshire (2009), Jersey (2010 and 2013), Chester (2011), Porthcawl (2012), Isle of Wight (2015) and Llandudno's North Wales Choral Festival (2017) . The annual Act of Remembrance, at the Harrow Civic Centre War Memorial is one of the most important events in the choir’s calendar. The Choir has for many years led the singing, along with the Grimsdyke Brass Band. This event brings together the whole community of Harrow – civic and religious; veterans, families, the TA, cadets, the scouting movement and the emergency services, to remember the ultimate sacrifice made to defend our freedom. The members of HAMC are proud of the choir’s long history and its association with the aircraft industry and the RAF. 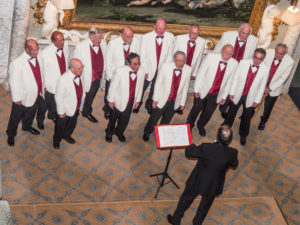 For many years, the Choir has supported Bentley Priory – home of the Battle of Britain Museum in Stanmore, including performing at the reopening in front of HRH the Prince of Wales. HAMC also performed at the Royal Opening of the Bomber Command Memorial, Hyde Park, in 2010. The choir celebrated both its 70th and 75th Anniversaries with special anniversary concerts, performing with the Central Band of the Royal Air Force and the Band of the Royal Air Force Regiment, respectively – with donations from both concerts going to the RAF Benevolent Fund. In 2016, the Choir also held a 75th anniversary dinner with guest speaker, Ralph Steiner, from the de Havilland Aircraft Museum. The next challenge for Harrow Apollo Male Choir is to continue to grow its membership to ensure that its existencein 2041 to celebrate its centenary. Although there has been a growth in choral singing over the past few years (with inspirational figures, such as Gareth Malone, leading the resurgence), there are far fewer men than women joining choirs. Our mission is to encourage men to take the risk, to open their mouths and to sing – and perhaps surprise themselves by how much they enjoy it!